Can you believe that it’s almost July? That means that it’s time to get crafting for the 4th of July celebrations. We love making our own crafts. It’s so much nicer to have homemade accessories for the day, rather than store bought ones. 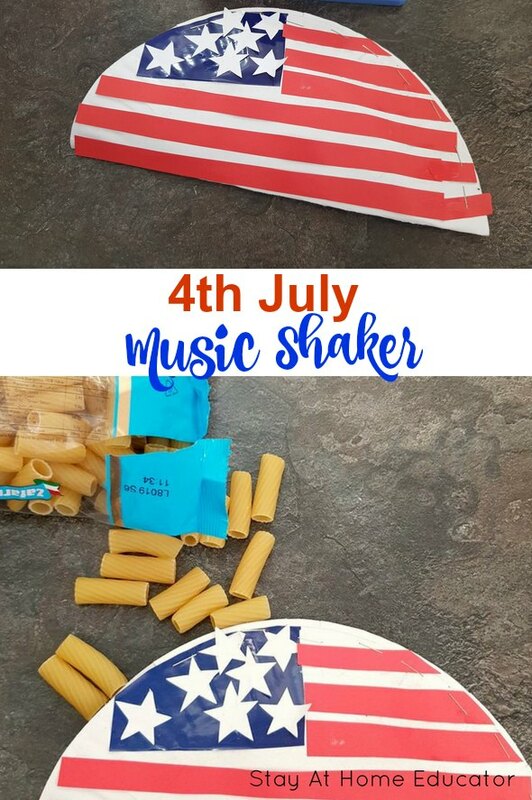 This July 4th music shaker is one of our favorites! We love making musical instruments as part of our music play activities. I mean, we have all the Melissa and Dough band in a box sets, but it’s so fun to make our own music crafts. These 4th of July music shakers are tried and true. They are sure to be a favorite at your house, too. 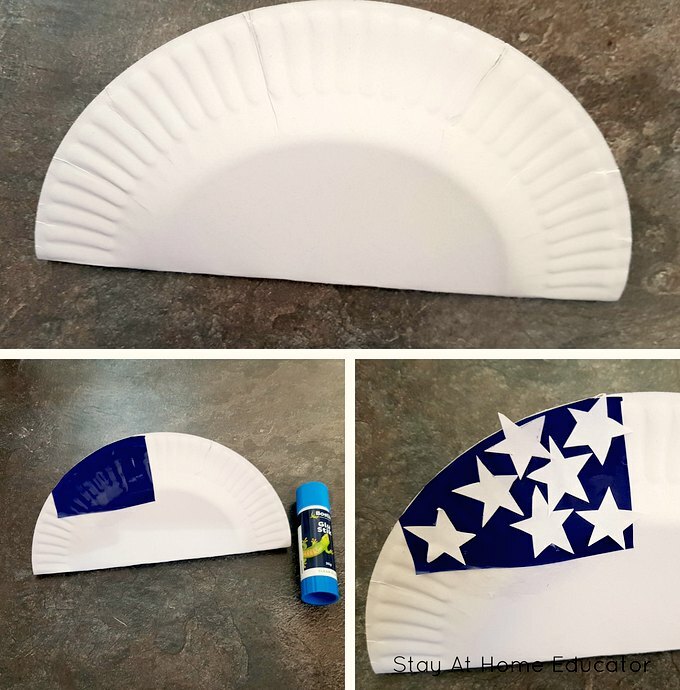 We have made similar versions of this paper plate shaker craft many times. 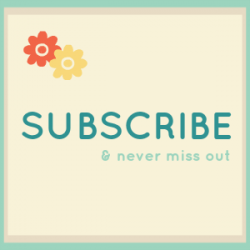 The materials needed are inexpensive and they’re quick and easy to make. 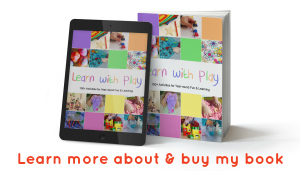 Perfect for a last minute activity or to add to any of your thematic planning. We especially love them for New Year’s Eve – any time you have a celebration works well! Since it’s almost the 4th of July, we thought it would be appropriate to make one with a USA flag on it. As usual, I tried to keep this activity as ‘kid made’ as possible (as you can tell from the uneven lines and the crooked stars!) because that’s the aim of any of our crafts. While it’s easy to step in and do things for them, we want them to do as much as they can themselves. Just a few basic steps. 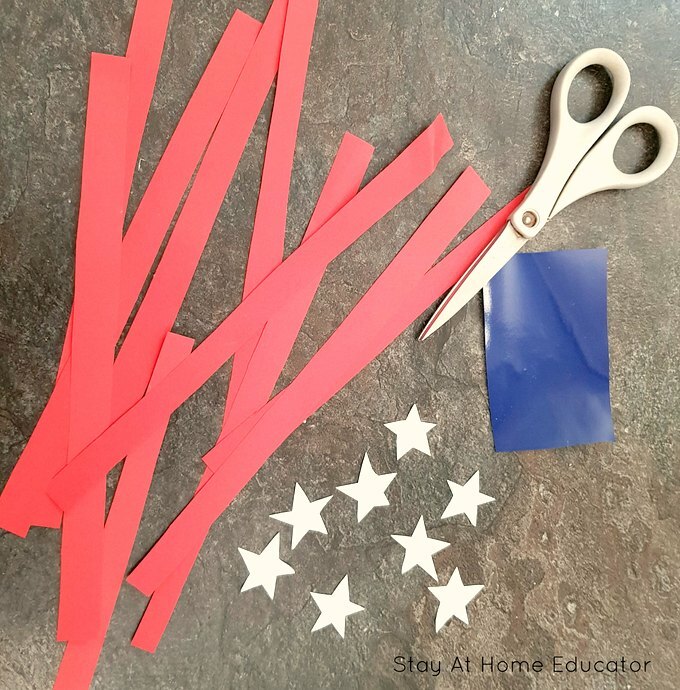 You will need to start by cutting out some stars (if you’re not using stickers) and having your child cut some strips of red paper (assist them if needed). Cut out a rectangle shape from the blue paper, as shown in the picture below. Glue the blue rectangle to the top right of the plate. Have your child glue on the red strips of paper. It’s fine if they go over the edge of the plate as you can cut them off afterwards. 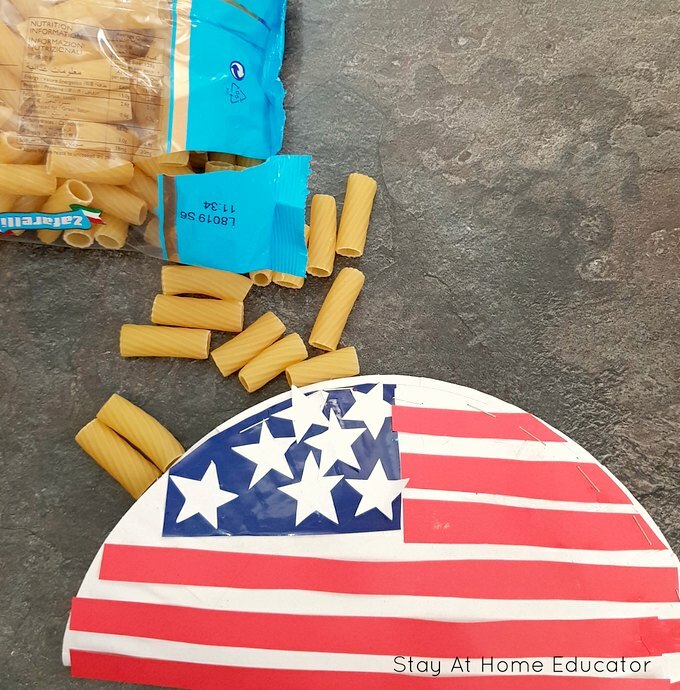 Staple around the edge of the plate, leaving a small gap so that you can fill it with pasta. 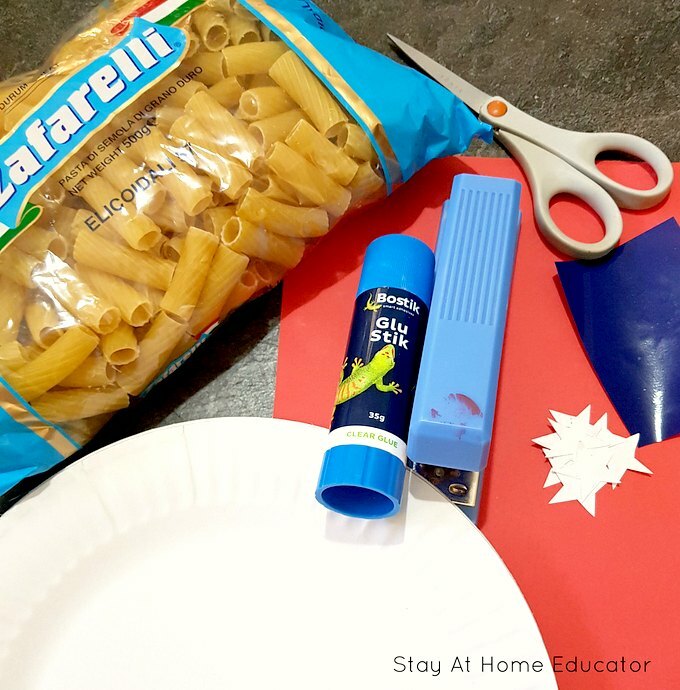 Fill the plate with pasta and staple up the open gap. 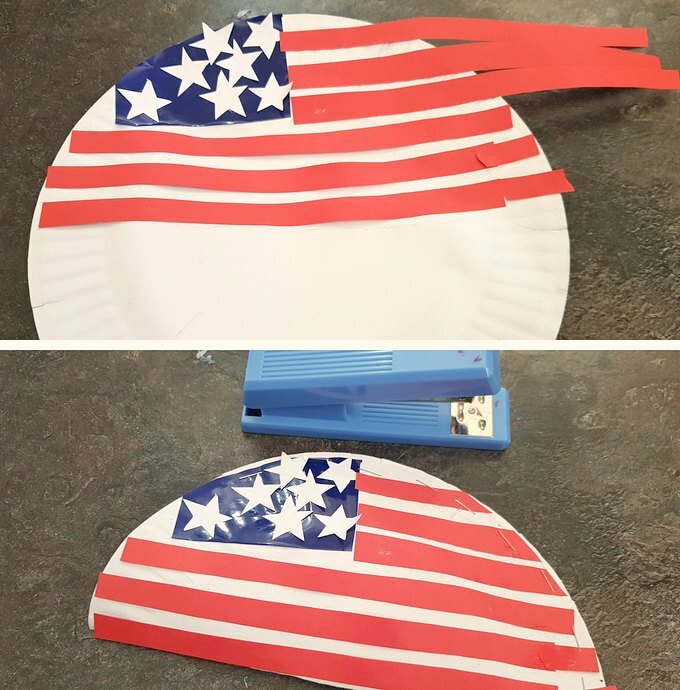 Have fun making your July 4th music shaker – I’m sure it will be a hit! Oh, and do I need to mention that these would be fantastic for a parade?!? 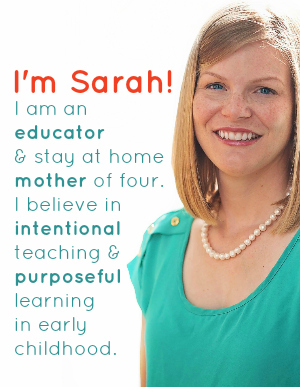 Who doesn’t want a parade of children with music shakers marching through the house or preschool? I, personally, love the idea!